Pick 3 colors that support it. Choose some games for the kiddies. Where do you find birthday decorations in Saskatoon? We have 3 stores here in Saskatoon, Stonebridge is the best location for everything. Depending on the season, you can get some pretty cool, inexpensive toys for the goody bags too! Walmart has a birthday section, it has the basics for your childs party and everything as you know is priced afforably. The store that I find has the best selection and the most product, is the one in Willowgrove/Arbor Creek/Erindale area. I like Dollarama because the store is smaller and filled will things that kids love. Mostly cheap and lasts for a few months of enjoyment. If you are looking to kick it up a notch, check out Bibbidi, they have costumes for girls party’s. They specialize in princess and have adorable princess costumes for your party. There is a great place online, called Birthday Express. 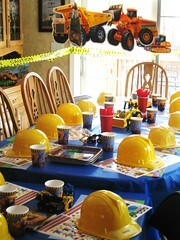 They provide you with everything you need for your child’s birthday party, minus the cake. You will love the site, check it out! I always find great cakes at any grocery store, Dairy Queen or Jerry‘s. Check out their cakes. If you do not find any that you like, they have a binder with cakes that they can design for your child’s party. If you want an extra fancy cake, have a look at Sugar Moon Cake Co in Saskatoon. They make beautful cakes! If you have any great places in Saskaoon to recommend, please list them.